The Eiffel Tower will soon be surrounded with bulletproof glass walls to protect the iconic monument from terrorist threats. Since the terror attacks that killed 130 people in Paris and Saint-Denis on Nov. 13, 2015, the iconic tower has been under constant surveillance. French soldiers and policemen patrol the site 24 hours a day. But the company that operates the tower, SETE, said the site still needed more security. The new perimeter will be unveiled to the public next month. But ABC News was given access to the construction site for a preview. 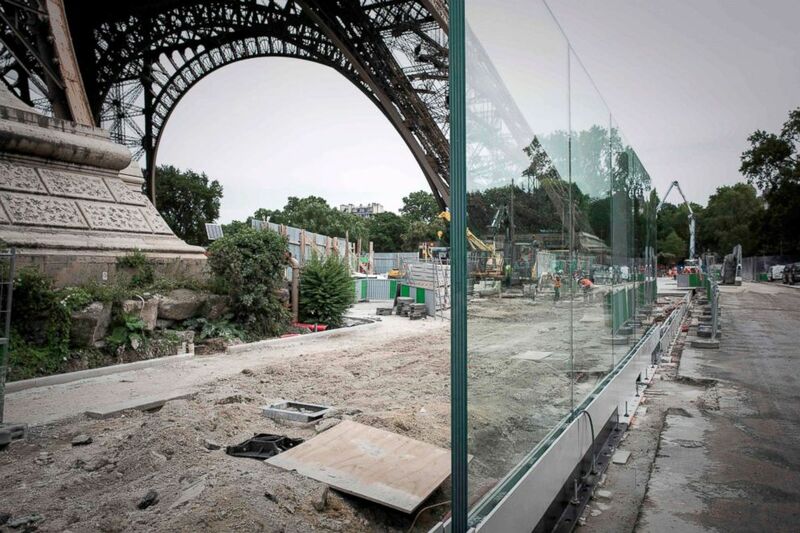 A bulletproof glass wall is to be set around the Eiffel tower as an anti-terrorism measure, June 14, 2018, in Paris. Temporary barriers were set up around the 1063-foot tower in June 2016. They are now being replaced by permanent bulletproof glass walls on the northern and southern ends of the landmark, and by metal fences on the eastern and western sides. Visitors will have access to the Eiffel Tower through these fences. He also said 420 blocks will also be installed in front of the glass walls to prevent a vehicle attack like the ones that have occurred in New York and across Europe. 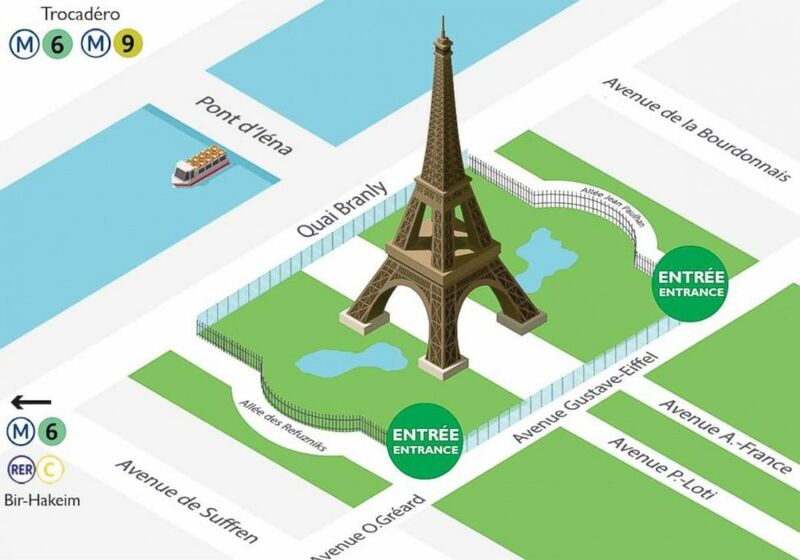 Graphic showing the future security perimeter with glass walls and fences around the Eiffel Tower. It will be unveiled in July 2018. The new security perimeter, which costs $40 million, will be completed and unveiled in July. But critics, including people living in the neighborhood near the Eiffel Tower, say that the walls will drastically change the appearance of the landmark, making it look like a fortress. Jean-Sébastien Baschet, the president of an organization called Les Amis du Champ-de-Mars, said in a statement last year that the new perimeter would affect local residents’ access to the gardens near the tower. “The privatization of the gardens located right next to the Eiffel Tower is unacceptable and incompatible with the notion of cohabitation, which is very important to our neighborhood,” Baschet said in a statement posted to the group’s website in May 2017. Baschet did not immediately respond to ABC News’ request for comment. Others see the barriers as necessary to protect visitors. “It will look much better than the temporary barriers that were installed two years ago, but most importantly, the security of our visitors will be increased, and this is our absolute priority,” Alain Dumas, technical director for the Eiffel Tower operating company, told ABC News. 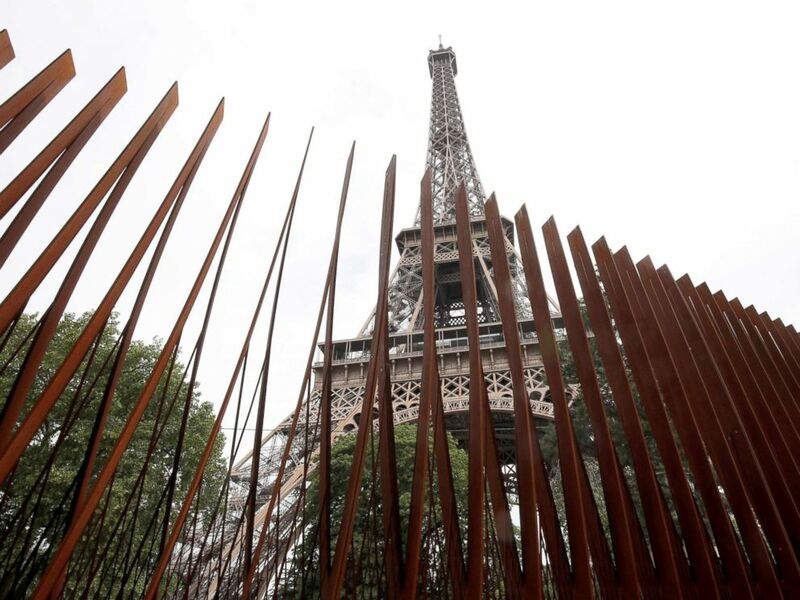 A security steel fence is pictured around the Eiffel Tower in Paris, June 14, 2018. Gaudillere said the threat of terrorism at the tower is very real. In August 2017, a man with a knife tried to breach security at the Eiffel Tower. He was quickly surrounded and arrested on the scene by French police. No one was hurt in the incident but the tower was briefly evacuated. After a difficult year in 2016 in which the numbers of visitors to the Eiffel Tower felt below 6 million people for the first time in 15 years, there has been a rebound.